Photos by Mike Moore | The Journal Gazette Concordia sophomore Meg Barkley, left, and Angola junior Kayla Fenstermaker fight for a loose ball in the third quarter of Monday's Class 3A sectional championship game at Concordia. Concordia sophomore Cierra Calloway tries to block a shot taken by Angola sophomore Hanna Knoll during the fourth quarter Monday. 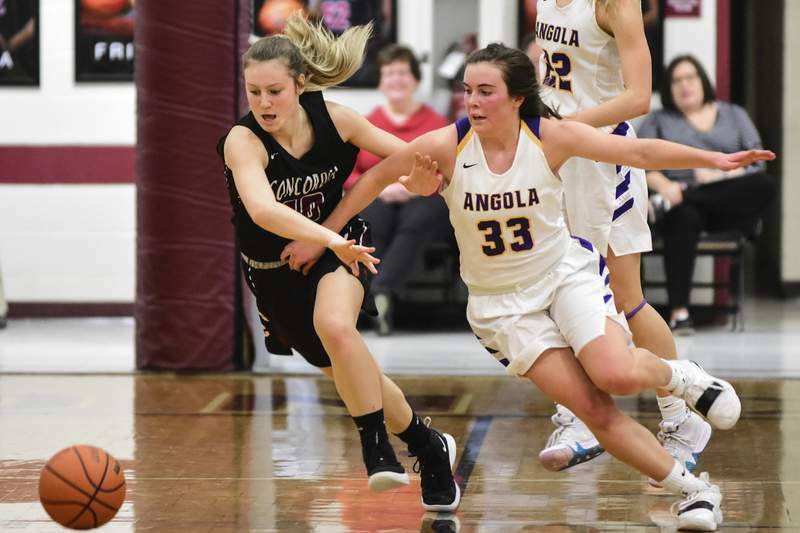 The Angola girls basketball team knew the history – littered with postseason losses to Concordia. But it felt it was exactly that – history – and proved it Monday night with a 58-43 victory in the Class 3A sectional championship game on the Cadets' own court. “This is so cool. It shows that we really came together and it shows just how good a team we are, how much we want it,” said junior Kayla Fenstermaker, who was a big part of the Hornets' dominant fourth quarter. While Angola clawed to stay in the game the first three quarters, not getting a lead until a Reace Peppler steal set up Sarah Duvendack for a fast-break layup and 37-36 lead with 2:32 remaining in the third quarter, Concordia still had a 39-37 advantage heading into the final quarter. But the Hornets quickly showed they thought nothing of the seven-straight games they had lost to Concordia during sectional play dating back to 2002. A Fenstermaker baseline drive opened the quarter. It was followed by a Hannah Knoll 3-pointer. And the Hornets went on a 12-0 run that didn't end until a Rhaya Kaschinske layup. Fenstermaker then made a shot from the lane for a 51-41 lead and it was then, essentially, game over. “It was crazy working this hard and finally getting this victory,” said Fenstermaker, whose Hornets came in having lost eight straight games to the Cadets, including the regular season, dating back to 2004, their last trip to regionals. But the feeling among the Hornets (20-6), who were led by sophomore Knoll's 18 points, Fenstermaker's 17 and 15 from Peppler, a senior, is that this is a new era for their program – and maybe for all of the sports at Angola. 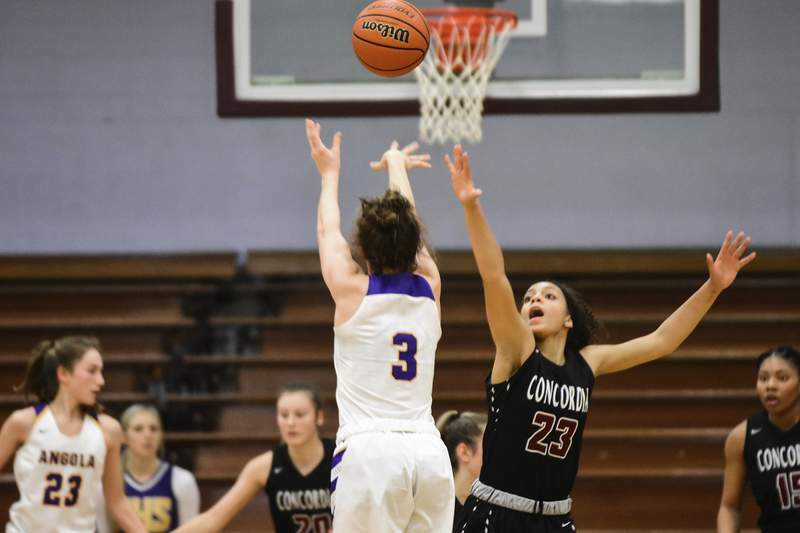 Concordia (17-7), which had made it to regionals the previous four years, was paced by senior Carissa Garcia's 15 points, including nine in the first quarter. Junior Ellesyn Fritcha had nine points, including a 3-pointer that put the Cadets up 28-19 in the second quarter, and Nautica Rogers, a senior, had nine points. But the fourth quarter was all Angola, as the Hornets outscored Concordia 21-4, led by Fenstermaker's nine points.